Yellowfin receives top rankings in worlds largest Business Intelligence Survey for Embedded BI and Operational BI, and recommended by 100% of surveyed end users in The BI Survey 18 by BARC. Yellowfin Receives Highest Rankings in World’s Largest Business Intelligence Survey. As voted for by people, not paid for by influencers. 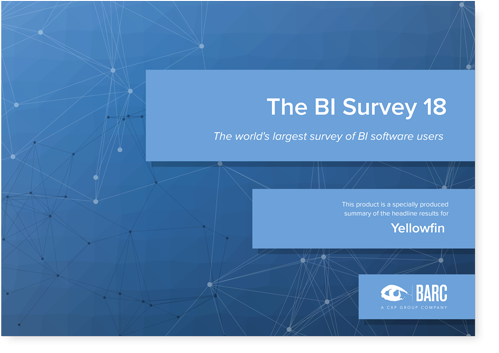 See how the world's largest independent Business Intelligence survey ranks Yellowfin against other vendors in The BI Survey 18. You get the unbiased assessment of the end users to help you make your decision on which BI and analytics tool is best for your business. BARC has ranked Yellowfin first for two key categories and a leader in 21 further categories across several peer groups. Here is the link to the survey, we’ve also sent a copy to your inbox so you have it for reference or for sharing with friends or colleagues.